We are very happy to introduce a new contributor to Jobu’s Rum. You may have read his comments on previous posts, but he’s decided to give us a full article this time. Please welcome Lou Brown! From the top, I want to be clear: there are no winners in the scandal currently engulfing Penn State. Anyone who suggests otherwise is gravely mistaken. That said, there are plenty of losers, which is altogether fitting, as there is more than enough blame to go around. However, it certainly appears that Joe Paterno, the legendary head coach of the Nittany Lions, is bearing the brunt of the media attention and criticism. Deserved or undeserved, icons draw attention, for better or worse. The details continue to emerge in this horrific story. Instead of looking at “who needs to go,” let’s look at the attempts to address the issue made by the Penn State administration. To date, four heads have rolled at Penn State: Athletic Director Tim Curly, Vice President Gary Shultz, University President Dr. Graham Spanier, and 46-year Head Football Coach Joe Paterno. Curly and Schultz have both been criminally charged with failing to report the incident to law enforcement authorities. 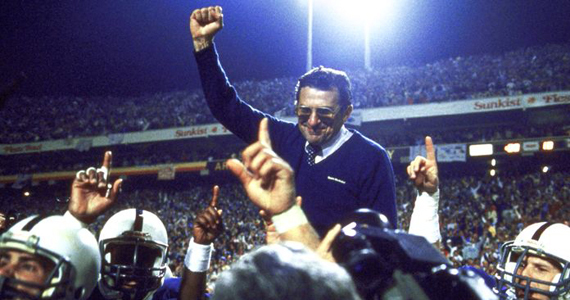 Spanier and Paterno have not been, and are not expected to be, charged with any formal crime. Paterno learned of the alleged abuse from then-graduate assistant Mike McQueary, who is currently a coach with the Penn State Football team. Here’s where things start to enter the gray area: two individuals who broke the law were fired; so were two who didn’t break the law; one main actor was not fired, despite acting congruently to one person who was fired. The main criticism of Paterno has been his failure to do more to report the alleged actions of former defensive coordinator Jerry Sandusky. Paterno learned of the abuse anecdotally from McQueary, who witnessed the abuse in 2002. Paterno reported the incident to AD Curly and VP Shultz. No one reported the abuse to the police. Both Paterno and McQueary reported the incident to their superiors. Curly and Shultz failed to do so. Presently, only McQueary remains employed by Penn State. Many are left wondering why JoePa had to go, but McQueary administrative leave?? I’m not suggesting that any of the firings were not justified: they all are. Paterno had to go. So did the others in the administration. But why not McQueary? Is his failure to report the incident he personally witnessed directly to the police any less appalling than the failure of the senior administration to do the same? Paterno upheld his ethical responsibility by reporting what he was told by McQueary. Conversely, Paterno was fired for failing to live up the “moral” standards expected by Penn State. “Moral responsibility” is a phrase that has been thrown around in various press conferences to explain the decision to relieve the involved actors from their positions. Yet, morality is a tricky issue. What is moral to one person may be amoral to another. For example, I think nothing of eating a hamburger. That’s because I’m not Hindu. So, what’s really going on at Penn State? Haven’t we seen this song and dance before? The parallels between the Penn State and Catholic Church child abuse scandals are revealing. In both instances, revered institutions opted to protect their image over protecting victims. Both did so by suppressing the truth in favor of saving face publicly. In choosing to protect their images, both institutions enabled the nightmare for even more victims. Enter the “ethical v. moral” debate: reveal a horrible scenario to the public, effectively ruining one’s reputation in the process, or bury your head in the sand and hope no one ever finds out. Perhaps Penn State thought they could ethically handle the situation “in house.” If so, then why does McQueary remain employed while Paterno was fired? That’s simple: because Paterno is the face of Penn State. Someone had to take the fall publicly for the sake of the the university, and who is more of a public face than JoePa? Ultimately, the Penn State board of trustees caved to public opinion and decided to cut off its nose to spite its face. In announcing the termination of Paterno and Dr. Spanier late Wednesday night, Board of Trustees Vice Chair John Surma said: “The university is much larger than its athletic teams.” This is an interesting choice of words. At its heart, this is not a story about athletics. Rather, it is a story about university administrators having a crisis of conscience. The university had been aware of the allegations for nine years, yet the outrage and reaction didn’t begin until law enforcement caught up with the internal cover up (or incompetency) early last week. In the end, the administration at Penn State needs to take a long hard look in the mirror, reevaluate its ethical and moral priorities as a university, and come clean about how such a miscarriage of trust and honesty could have been allowed to occur. Joe Paterno isn’t the center of this horrible tragedy. Did he do enough? He though that he did. Could he have done more? Yes. Should Penn State have done more as a whole? Absolutely. Instead, after 46 years at the helm, the Penn State board of trustees voted to mutiny Joe Paterno so no one would notice the rats jumping off of the sinking ship.